Alvaro Morata’s move to Manchester United is finally set to happen, according to a number of top newspapers in Spain. The striker has been at the center of a transfer saga that has gone on since the latter stages of last season, but still, there has been no conclusion to the rumours. 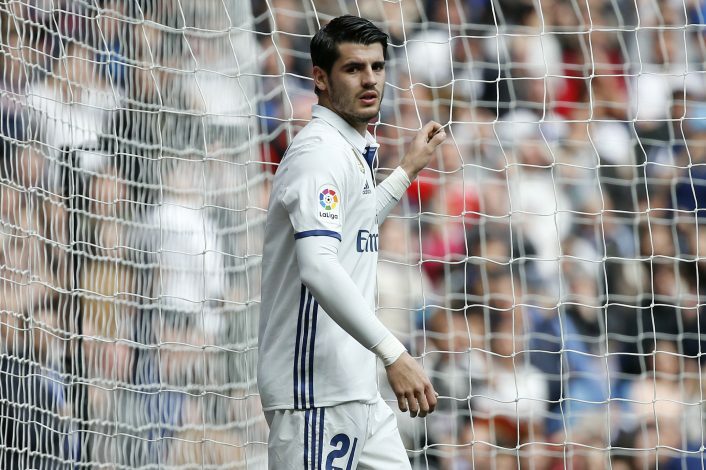 However, yesterday, Morata’s father Alfonso and his agent Juanma Lopez attended a meeting at the Santiago Bernabeu to discuss the Spanish striker’s future. And now, Spanish newspaper AS have released reports suggesting that the transfer is on the verge of being completed – even going so far as to suggest that the transfer could be completed within the next 72 hours. Jose Mourinho’s men set out for the United States on the 9th of July, and the Portuguese boss is apparently anxious to have the transfer completed by then. Mourinho has always preferred to have his dealings finalized as early as possible, and having already sealed a move for Benfica’s Victor Lindelof, completing a move for Morata would allow him to focus on other targets, as he attempts to mould his squad according to the ideas he has planned out for the upcoming season. The Spaniard is set to sign for the club for a fee around €70 million, and while Real were holding out for around €80 million, United are not willing to pay over the odds for him. Meanwhile, Real would rather see the deal go through, as they themselves are reportedly eager to sign Kylian Mbappe and Eden Hazard, and the money earned from the Morata deal is set to be spent on the recruitment of their two main targets. Wazza will come back and giant united? ?